Roughly half of all cyber attacks target mid-sized or smaller businesses and the attack landscape continues to grow with higher volume and sophistication. Plus, network bandwidth requirements are still doubling every 18 months. Mid-sized enterprises need network security that delivers industry-leading high-speed performance and next generation security effectiveness. The FortiGate 400D appliance delivers superior performance through a combination of purpose-built FortiASIC™ processors, high gigabit port density and consolidated security features from the FortiOS™ operating system. It delivers 5 times better next generation firewall performance compared to alternate products and provides the best price/performance in the industry. 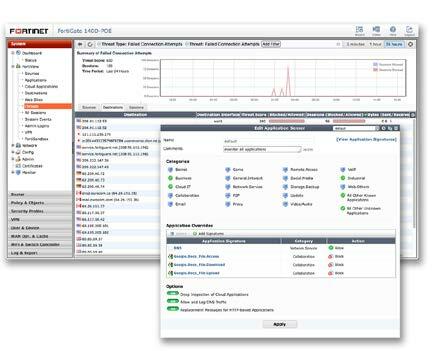 This breakthrough threat prevention performance allows organizations to run NSS Labs Recommended intrusion prevention and application control and VB100 certified anti-malware capabilities for deeper inspection. Rich console views and reports together with a flexible policy engine provide the visibility and control to empower employees yet secure your enterprise. Finally, these features of the FortiGate FortiOS Network Security Platform are routinely validated by independent real-world tests and consistently getting superior ratings in security effectiveness. Custom FortiASIC™ processors deliver the power you need to detect malicious content at multi-Gigabit speeds. Other security technologies cannot protect against today's wide range of content and connection-based threats well because they rely on general-purpose CPUs, causing a dangerous performance gap. FortiASIC processors provide the performance needed to block emerging threats, met rigorous third-party certifications, and ensure that your network security solution does not become a network bottleneck. Security Research - FortiGuard Labs have discovered over 170 unique zero-day vulnerabilities to date, totaling millions of automated signature updates monthly. Comprehensive Security - Control thousands of applications and stop more threats with NSS Labs Recommended IPS, sandboxing, VB100 certified antimalware and more. Superior Control and Visibility - Stay in control with rich visibility over network traffic, granular policy control, and intuitive, scalable security and network management. Robust Networking Capabilities - Optimize your network with extensive switching and routing, high availability, WAN optimization, embedded WiFi controller, and a range of virtual options. Comprehensive Support - For customers who need aroundthe- clock mission critical support, including advanced exchange hardware replacement. Download the Fortinet FortiGate 400D Datasheet (PDF). 4 pairs of mounting ear brackets for FG-300C, FG-300D, FG-400D, FG-500D, FG-600D and FHV-500D.